News-feature treatment before January 2012.
some people said they could not find stories other than the top one, even though the stories cycled through the main slot. And with our upcoming events “ticker” above the image, it was easy to mistake that line for the headline, which was actually below the picture. Finally, we had had perpetual complaints about it being impossible to find older stories once they dropped off the main page. So we changed to the current format, which has only one photo with nothing cycling. We pulled the headlines for other important stories up to the right of the main image, and visually separated the ticker from the main news box. We also added an archive to older stories. There was no overwhelming reaction. Our customer-satisfaction survey showed the exact same ratings for overall satisfaction and look and feel for the three months before the switch and the five months since. The navigation rating dropped a single point. Still there were some complaints, primarily about having only one image. People expected to have an image come up in relation to the secondary stories. We’ve tried to address that, and you can see the result on this mockup. Instead of headlines for other stories, you have thumbnails that link to them, with an additional link to the archive. In keeping with the original changes, nothing happens as you move your mouse. You have to click. When you do, the large thumbnail and text comes up for that story. We’re interested in your feedback — please let us know what you think. And a heads up that we’ll be coming back to you within a month or so for your ideas on what the next major overhaul of www.NASA.gov should look like. Over the last few weeks, we’ve set up and begun doing a beta test broadcast of NASA TV onto your Apple iPhone, iPad, and iPod Touch. We tweeted it out early yesterday to our Twitter followers before the landing of the Space Shuttle Atlantis once we were sure it was ready to have more of a spotlight shone on it. 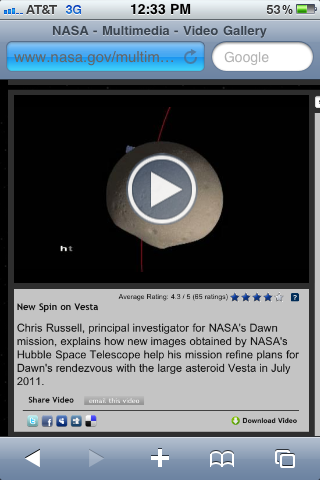 It’s also been linked on the NASA TV web page in the left column for the last couple of weeks since we set up the stream. 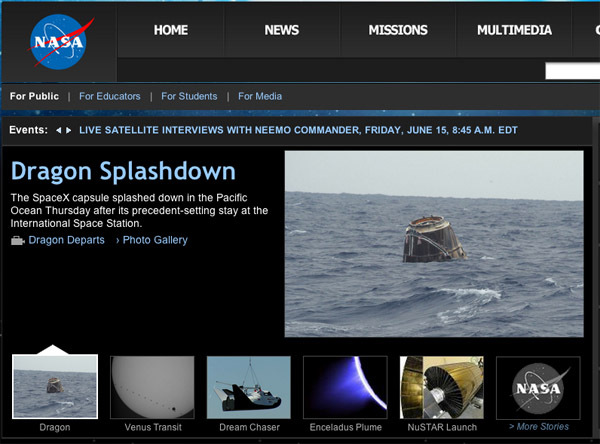 This specially formatted HTML5, H.264 stream was set up to test out new streaming technologies within the NASA network infrastructure and to demonstrate the technology as practical given the resources available for NASA.gov. During the beta period, we’re trying to identify issues and concerns with the reliability and delivery of the stream to you, our users. We’re also trying to gauge the interest of our online audience in having NASA TV available for streaming on the iPhone and other mobile devices. For now, this is just the first step. If everything goes well during the beta test period, we’ll evaluate our next steps taking into account the availability of our limited resources. For the immediate future, this is an open ended beta test period. We are listening for feedback on the quality, reliability, and availability of the NASA TV stream. We’re also listening for ideas of what you think the next steps should be. 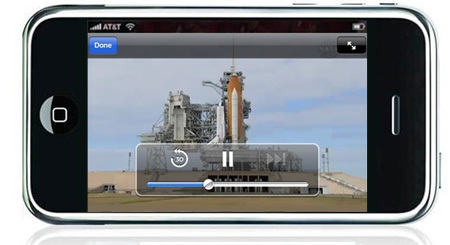 Some of the ideas we’ve most often heard are integration of NASA TV into the NASA iPhone App, mobile apps for other devices such as Android and Blackberry, and streaming NASA TV onto other devices. We’ve purchased the hardware that will allow us to do some of these ideas and expect to begin more streaming this summer. As always, you can e-mail the NASA.gov Web Team at webcomments@hq.nasa.gov or drop us a line in the comments. We also monitor tweets sent to @NASA. We’ll try to respond as time allows, but know that we read every comment, e-mail, and tweet sent our way. We’ve been streaming NASA TV on the web in earnest since 2004, when the Mars Exploration Rovers landed. Then 50,000 people watched our mission coverage on RealMedia, in windows probably not much bigger than today’s smartphone screen. Seven years later, more than 560,000 people watched the launch of the last space shuttle mission, many of them on an HD feed in Adobe Flash that filled a 22-inch monitor quite respectably. Others watched on their phones and tablets. Over the course of the mission, all that video meant that in two weeks we shipped almost as much data (1.2 petabytes, or more than 1.2 billion megabytes) than we did in all 2010. Discontinue streaming in RTSP format. That last will affect users of older Android phones, those operating on OS 2.1 or earlier. Unfortunately, the cost of the RTSP stream was quite high (higher even that the main HD feed of NASA TV) and the audience was never very big, fewer than 800 during peaks that saw hundreds of thousands of users on other formats. So it simply didn’t make sense to keep doing it that way. While we hate to shut down any capability, we do have to manage the taxpayers’ money smartly. You’ll see these changes take affect late next week. We’re sorry for any inconvenience. As we prepare for the final space shuttle mission, NASA.gov is planning special coverage for the end of this era. Today, the first element of our special coverage rolls out onto the homepage in the form of a promotional graphic and link to get the latest information about the STS-135 mission and the end of the Space Shuttle Era. Keep checking back as we rollout additional new features and special coverage in the coming days and weeks ahead. P.S. – Have you read some of the wonderful stories in the Space Shuttle Era section detailing every part of over 30 years of the Space Shuttle Program? If not, you really should. It’ll give you a great many perspectives on the entire monumental program. 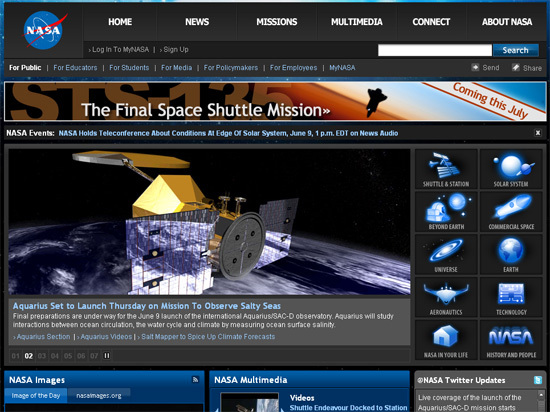 Short blog entry today, just letting you know that you can watch the April 29 launch of STS-134 on your Android device. 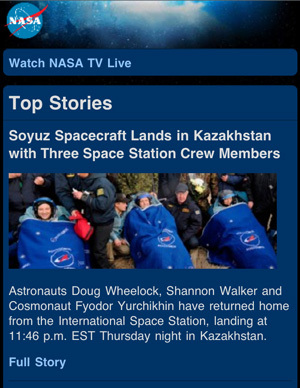 Go to mobile.nasa.gov and select the “Watch NASA TV Live” link at the top. Be forewarned: it’s a beta, and we may reach a capacity limit. Also, because there are so many different devices using Android, some of them using different flavors of the OS, it’s possible the feed won’t work on some devices. We’ve tested them on as many as we can, but it’s impossible to be exhaustive. If you can’t get the feed, please let us know what device you’re using and, if you can, the version of Android and the media player. Certainly has been an interesting few days for live video around here. Last week Yahoo, which has provided WindowsMedia streams of NASA TV since 2005, told us they wouldn’t be able to support the launch as they were reserving all their capacity for the royal wedding earlier in the day. They’re apparently expecting quite a bit of on-demand traffic for replays. Fortunately, we were able to work with Ustream to beef up our connections there. There’s still a bit of a scramble since our primary feed comes out of the Marshall Space Flight Center, which was severely affected along with the rest of northern Alabama by Wednesday’s severe storms. As far as we know here in D.C., our people are fine, which is good. But our thoughts are with everybody there and across the south who has been touched by the storms. As always, let us know how we’re doing, whether it’s with the Android stream or any other aspect of the site. You’ve seen the designs. You’ve witnessed us asking for feedback on them. 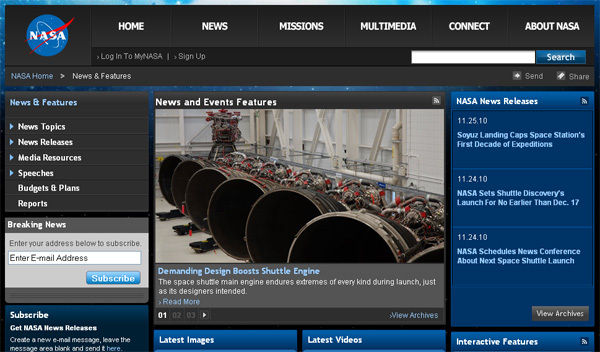 Now, we’ve unveiled the new navigation menus on NASA.gov. Visit the site to check them out. These new navigation menus have been several months in the making. They started as stick-figure-like wireframe documents, and then became graphics. We them modified and played with different colors, textures, patterns, styles and other design elements. We settled on the designs we posted to this blog several weeks ago and we solicited and received lots of feedback. Our goal for these new menus was to make readily apparent popular, as well as hard-to-find content. The new menus highlight this content and other information, resulting in fewer clicks to find the links that are the most sought after. This is coupled with the standard sub-categories for each section of the site, featured links or other popular content. Since you last saw the menus, we have worked to transform the designs into code and then tested those newly coded menus on our staging environment. This process took user feedback into consideration, which resulted in the tweaking of the menus to include changing a few of the labels and refining some of the content showcased by those menus. We then integrated our existing analytics into the menus to automatically populate certain pieces of the menus. Finally, we tested the functionality of the new menus and worked to resolve any conflicts that may have arisen. At long last, we’re happy to officially roll-out this project. Now we are moving on to other development projects, including getting embedded videos to play on tablet devices. We’re also working on other projects, and as always, we look forward to receiving your feedback. The tweets to @NASA, the e-mails to webcomments@hq.nasa.gov and the comments on our blog posts help us improve the site. mobile.NASA.gov – We’ve mentioned it in passing before, but we’ve rolled out a new mobile version of the agency’s website, aggregating the latest news, features and images onto your mobile devices. More features are still to come, and we’ll update you with a full post about the mobile site soon. go.NASA.gov – Our new URL shortener helps us save characters within our tweets, and it also signals you that clicking on a go.nasa.gov URL will lead you to a NASA-related web page. We’ve worked to integrate this URL shortener (powered by bit.ly) into most of our social media tools and are working to integrate it into our sharing tools as well. 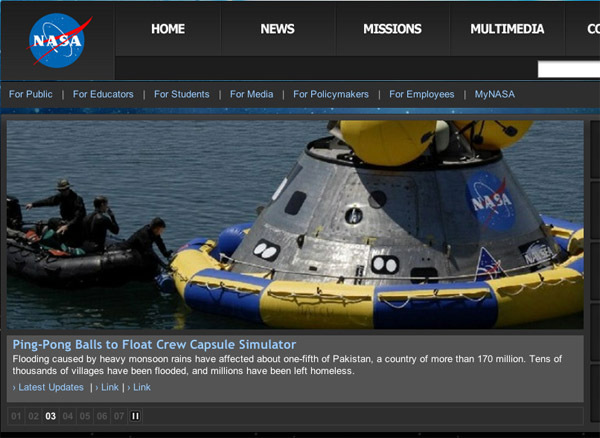 Slideshows – We’ve rolled out new slideshows on the homepage and on many sections of NASA.gov. These slideshows automatically step through a series of latest news or features, but you can also take control and manually navigate the content. This new design has a larger image and gives us more spots for showcasing material from around the site. We’re rolling out this feature across the site as we update each section. Tweet/Like buttons – We’ve added the “Tweet” and “Like” buttons you may recognize from other news sites to the top of our story pages. These buttons allow you to easily tweet the title of the story and URL to your Twitter account, or “like” the story on your Facebook profile. This tighter integration between those two networks and NASA.gov will make it easier for you to let your friends and followers know what you’ve found interesting on our site. We’re continuing to look at other ways to more closely tie our content with the social media sites you use. These are some of the larger items we’ve worked on this fall. Thanks to all of you who continue to give us feedback about the site. The tweets to @NASA, the e-mails to webcomments@hq.nasa.gov and the comments on our blog posts help us improve the site. We’re thankful for all of you who have taken the time to come to NASA.gov and want you to keep coming back to catch up on the latest news and information about NASA. Last month, Google released what it considers the top 1,000 web sites in the world and NASA made the list. We were honored to make the cut and were the third highest federal government site on the list. Some would think that a well deserved vacation is in order since we’re already on the top web site list. But our teams are working harder than ever to improve the site. We added images to the ‘What are people interested in?’ box on the homepage. 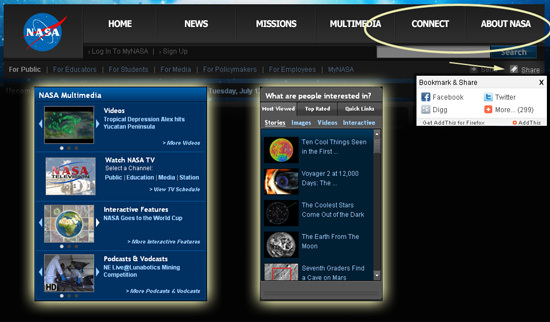 We changed the navigation on the homepage multimedia box so that the options are clearer within each panel of the box. We swapped the ‘Connect’ and ‘About NASA’ buttons in the top navigation bar to reduce confusion since we found several users intuitively saw ‘Connect’ and thought ‘Contact’ since the words are similar and that’s a more standard placement for contact information. We pared down the ‘Share’ options at the top of pages from a list of hundreds to four-options which then expand out to the full list. We tweaked the information we provide when you share our pages on Facebook so that it shows a image to illustrate each page and video. A compilation of screenshots of some of the changes we made to the site recently. Additional improvements in the works include updating our Twitter box on the homepage to make it easier to understand which tweets are coming from where, adding additional Facebook and Digg integrations so you can ‘Like’ our pages without having to share them on your social networks, and making improvements to our mobile web to accommodate smartphone users visiting NASA.gov. As these improvements come online, we’ll be sure to let you know.